Hi everyone, many people have mentioned in their posts someone named Brooke. That would be me, I’m your host for this journey and the person our lovely bloggers run to when they have questions about this whole procedure. Today was pick up day. I think I was just as excited as the bloggers, we have never done anything like this before and we are excited to be able to interact with people this way. It was also the kick-off of Husky Help the Hungry Week. First thing this morning I was at Husky headquarters for the launch of the week’s activities and a proclamation by the City that June 1-7 is officially Help the Hungry Week here in Calgary. You can find out all about Husky Help the Hungry Week by visiting the Food Bank’s website. This blog is a part of the overall goal of raising awareness for hunger in our city. 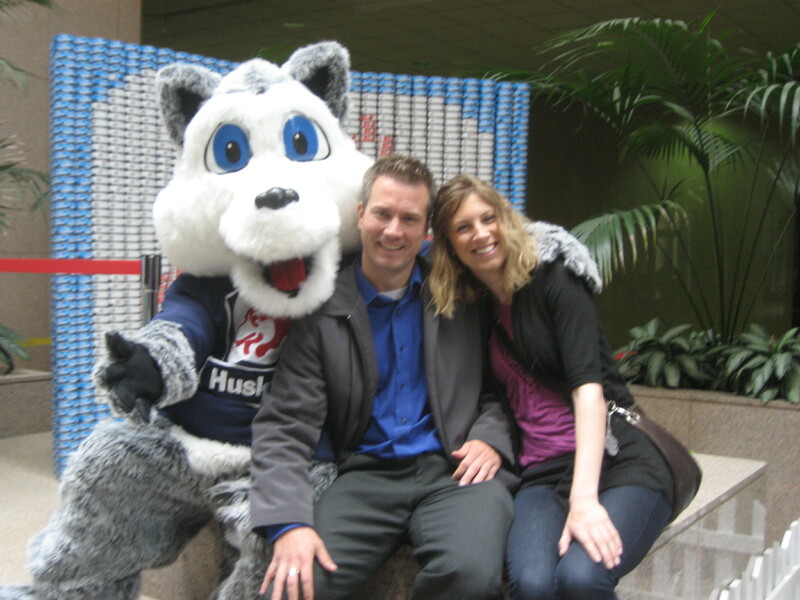 Two of our participants, Leah and Darren, take a picture with Husky's mascot in front of a mural built of tuna cans. Every food bank operates a bit differently. Hamper contents are very different in one city than the next. Some give out fresh produce, some don’t. Some give out pre-built hampers while others use a shopping type of experience allowing people to pick and choose what they want out of the available items. At the Calgary Food Bank we give out pre-built hampers of non-perishable items that we add perishables and extra items too. Some of the participants have been talking about the things that are in their hampers. Some items are random, some things are what we call guaranteed items. The guaranteed items are in quantities that are based on Canada’s Food Guide, they are supposed to meet the requirements for a balanced diet. In addition there are fresh fruits and veggies that are added when we have them. Today some people got oranges and apples in their bags, some didn’t. This is because our volunteers take all the fresh produce and make mixed bags of what we have and hand them out. The bags are made by size, not necessarily types of fruits and vegetables since what we get in from day to day varies greatly. Clients usually also get a bag of potatoes as well as the mixed fruit and vegetables. We also put little extras in the hampers. These extras can be cookies, pudding, candy and sometimes a couple of cans of pop. These are things that are donated to us, that may not have great nutritional quality, but are a nice treat, especially if a family can not afford to buy themselves little treats from time to time. Most people don’t know that the Calgary Food Bank is held to the same standards and regulations as anyone else who handles food, whether they be grocery store or manufacturer. Our staff who work with the food that comes in have taken safe food handling courses and certifications and our volunteers are also offered the opportunity to participate in these workshops. I think the most important thing that I can tell someone about the Calgary Food Bank is that we are neither government nor United Way. We are able to distribute food from the donations and support of the wonderful people in Calgary. We strive for quantity and quality of food, and trying to hit all of the recommended food groups from the donations that people give us. 100 volunteers a day sort food, build hampers and distribute the hampers to people who visit the Food Bank. We truly could do nothing without our fantastic volunteers and the donations that allow them to continue to do the great work they do. Entry filed under: Calgary Food Bank.